Ph.D./Master Student positions, and undergraduate SRT (Student Research Training) available; Join us! March, 2019: Proud to receive The National Early-Career Award with RMB 3 million grants. March, 2019: Joining NVMSA 2019 as a TPC member. March, 2019: Joining NANOARCH 2019 as a Web/Registration Chair. February, 2019: Paper on low-cost wide-temperature-range 16-bit D/A converter accepted to GLSVLSI 2019. February, 2019: Paper on 2T/ and 3T/cell general-purpose FeFET NVM accepted to IEEE Design & Test. January, 2019: Paper on 3T/cell symmetric FeFET NVM accepted to DAC'2019; my undergrad student Juejian as first author. A good start! January, 2019: Invited to write the February ACM E-Newsletter "What Is" column on Ferroelectric FETs. December, 2018: Longqiang received the National Graduate Scholarship. Congrats! December, 2018: Joining GLSVLSI'19 as a TPC member. October/November, 2018: Prof. Alan Seabaugh, Suman Datta, Vasilis Pavlidis visited us. June, 2018: Chaired Session "Enter the Zoo of Emerging Devices" in 2018 Design Automation Conference (DAC'18), San Francisco, USA. May, 2018: Chaired the Track II on Future Vehicle Technologies of 2018 Tsinghua-Rohm International Forum of Industry-Academia (TRIFIA'18). May, 2018: Professor Tsu-Jae King Liu from UC Berkeley visited us and gave an invited talk. April, 2018: IEEE TED paper accepted: A new FeFET nvDFF design. April, 2018: A visit at University of Notre Dame. March, 2018: Special session proposal accepted to ISVLSI'18: Design using Emerging Devices. February, 2018: Paper accepted to IJCTA on DAC redundancy design and optimization. February, 2018: Paper accepted to Analog Integrated Circuits and Signal Processing: our first TRI-DEMRZ tape-out. January, 2018: Transitioning from Penn State to Tsinghua University as a Tenure-Track Assistant Professor. "Beyond-CMOS" circuit and system design using emerging devices, e.g. Tunnel FETs (TFET), Ferroelectric negative capacitance FET (FeFET, NCFET), PhaseFET, SymFET, etc. Various research topics in this area exhibit opportunities beyond CMOS solutions to enable "More Moore" and "More than Moore". Refer to publications for more details. Mixed-signal CMOS IC design, including high-performance data converters, energy harvesters (rectifier, DC-DC converter), memory, etc. Special interests on high-performance D/A converters of over 16 bits and 5-GS/s sampling rates. Recent fabricated 14-bit 3.0-GS/s DACs work with up to 72dB SFDR @ 422MHz and 60dB SFDR @ 600MHz performance. Paper reviewer for Journals: JSSC, TCAS-I, TCAS-II, TVLSI, TCSVT, TCAD, TNANO, TMTT, EDL, JEDS, JETCAS, IEEE ACCESS, JCSC, JxCDC, etc. National Science Foundation of China (NSFC), 61874066, 01/2019-12/2022, "Research on FeFET-Based On-Chip Nonvolatile Memory and Computing"
National Science Foundation of China (NSFC), 61720106013, 01/2018-12/2022, "Normally-off Nonvolatile Intelligent Computing Chips for Internet of Things"
Juejian Wu, Hongtao Zhong, Kai Ni, Yongpan Liu, Huazhong Yang, Xueqing Li, "A 3T/Cell Practical Embedded Nonvolatile Memory Supporting Symmetric Read and Write Access Based on Ferroelectric FETs," in 56th Design Automation Conference (DAC'2019), accepted. Xuedi Wang, Xueqing Li, Longqiang Lai and Huazhong Yang,"A 16b Clockless Digital-to-Analog Converter with Ultra-Low-Cost Poly Resistors Supporting Wide-Temperature Range from -40℃ to 85℃," in The 29th edition of the ACM Great Lakes Symposium on VLSI (GLSVLSI), accepted. Srivatsa Srinivasa, Akshay Krishna Ramanathan, Xueqing Li, Wei-Hao Chen, Sumeet Kumar Gupta, Meng-Fan Chang, Swaroop Ghosh, Jack Sampson, and Vijaykrishnan Narayanan, "ROBIN: Monolithic-3D SRAM for Enhanced Robustness with In-memory Computation Support," in IEEE Transactions on Circuits and Systems, accepted. 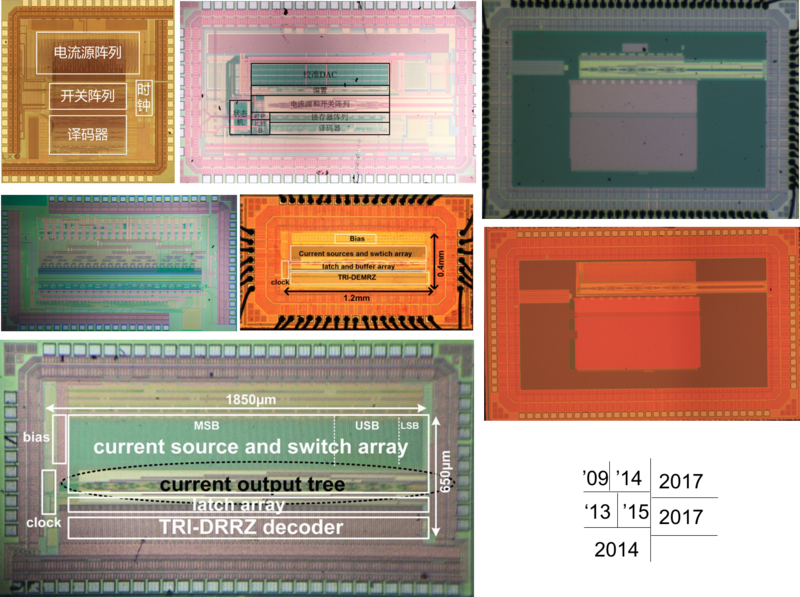 Zhe Yuan, Jinshan Yue, Huarui Yang, Zhibo Wang, Jinyang Li, Yixiong Yang, Qinwei Guo, Xueqing Li, Meng-Fan Chang, Huazhong Yang, and Yongpan Liu, "STICKER: A 0.41-62.1 TOPS/W 8bit Neural Network Processor with Multi-Sparsity Compatible CNN Arrays and Online Learning Acceleration for Fully Connected Layers", IEEE VLSI Symposium 2018. Srivatsa Rangachar Srinivasa, Akshay Krishna Ramanathan, Xueqing Li, Wei-Hao Chen, Fu-KuoHsueh, Chih-Chao Yang, Chang-Hong Shen, Jia-Min Shieh, Sumeet Gupta, Meng-Fan Marvin Chang, Swaroop Ghosh, John Sampson, and Vijaykrishnan Narayanan, "A Monolithic-3D SRAM Design with Enhanced Robustness and In-Memory Computation Support," ISLPED’2018. Xueqing Li, Sumitha George, Kaisheng Ma, Wei-Yu Tsai, Ahmedullah Aziz, John Sampson, Sumeet Gupta, Meng-Fan Chang, Yongpan Liu, Suman Datta, Vijaykrishnan Narayanan, "Advancing Nonvolatile Computing with Nonvolatile NCFET Latches and Flip-Flops," IEEE Transactions On Circuits and Systems I: Regular Papers, vol.64, no.11, pp.2907-2919, November 2017. [LinkToIEEE]. Kaisheng Ma, Xueqing Li, Xiao Shen, Yiqun Wang, Huichu Liu, Shuangchen Li, Karthik Swaminathan, Yongpan Liu, Yuan Xie, John Sampson, Vijaykrishnan Narayanan, "Dynamic power and energy management for energy harvesting nonvolatile processor systems," ACM Transactions on Embedded Computing Systems (TECS), vol. 16, issue 4, September 2017. [LinkToACM]. Kaisheng Ma, Xueqing Li, Srivatsa Rangachar Srinivasa, Yongpan Liu, John Sampson, Yuan Xie, Vijaykrishnan Narayanan, "Spendthrift: Machine Learning Based Resource and Frequency Scaling for Ambient Energy Harvesting Nonvolatile Processors," ASP-DAC 2017 (BEST PAPER AWARD). Yinan Sun, Zhe Yuan, Yongpan Liu, Xueqing Li, Yiqun Wang, Yu Wang, Vijaykrishnan Narayanan, and Huazhong Yang, "Maximum Energy Efficiency Tracking Circuits for Converter-less Energy Harvesting Sensor Nodes," in IEEE Transactions on Circuits and Systems II: Express Briefs, vol.64, no.6, pp.670-674, June 2017. Srivatsa Srinivasa, Ahmedullah Aziz, Nikhil Shukla, Xueqing Li, Jack Sampson, Suman Datta, Jaydeep P. Kulkarni, Vijaykrishnan Narayanan, and Sumeet Kumar Gupta, "Correlated Material Enhanced SRAMs with Robust Low Power Operation," in IEEE Transactions on Electron Devices, vol. 63, no. 12, pp. 4744-4752, Dec. 2016. [pdf]. Xueqing Li, Kaisheng Ma, Sumitha George, John Sampson, and Vijaykrishnan Narayanan, "Enabling Internet-of-Things: Opportunities Brought by Emerging Devices, Circuits, and Architectures," VLSI-SOC 2016 [pdf]. Matthew Jerry, Wei-yu Tsai, Baihua Xie, Xueqing Li, Vijay Narayanan, Arijit Raychowdhury, and Suman Datta, "Phase Transition Oxide Neuron for Spiking Neural Networks," in 74th Device Research Conference (DRC 2016) [pdf]. Sumitha George , Ahmedullah Aziz, Xueqing Li, Moon Kim, Suman Datta, John Sampson, Sumeet Gupta, Vijaykrishnan Narayanan, "Device Circuit Co Design of FEFET Based Logic for Low Voltage Processors," ISVLSI 2016, [pdf]. Moon Seok Kim, William Cane-Wissing, Xueqing Li, John Sampson, Suman Datta, Sumeet K. Gupta, Vijaykrishnan Narayanan, "Comparative Area and Parasitics Analysis in FinFET and Heterojunction Vertical TFET Standard Cells", JETC, 2016, [pdf]. Sumitha George, Kaisheng Ma, Ahmedullah Aziz, Xueqing Li, John Sampson, Asif Khan, Sayeef Salahuddin, Meng-Fan Chang, Suman Datta, Sumeet Gupta, and Vijaykrishnan Narayanan, "Nonvolatile Memory Design Based on Ferroelectric FETs," DAC 2016, [pdf]. Kaisheng Ma, Xueqing Li, Shuangchen Li, Yongpan liu, Jack Sampson, Yuan Xie, Vijaykrishnan Narayanan, "Architecture Exploration for Ambient Energy Harvesting Nonvolatile Processors," IEEE Micro, May/June 2016 (IEEE Micro Top Pick Award), 2016, [pdf]. Jianan Liu, Xueqing Li, Huazhong Yang, Qi Wei, Fei Qiao, ”Time-relaxed time-interleaving DEM decoder (时间松弛交织的归零动态元件匹配编码器),” 2015.5.15, China, CN201510250635.1. Jianan Liu, Xueqing Li, Huazhong Yang, Hui Wang, Qi Wei, Fei Qiao, Zhen Xu, “A dynamic element matching decoder (动态元件匹配编码器),” 2015.05.15, China, CN201510250374.3.